I thought I'd throw this in here so people would hopefully notice it. Does it bother you when people link to their blog in comments? I've heard that it is a common pet-peeve. I have started doing this in many of my comments. My reasoning? I try as much as I can to comment back on every comment I receive. It is so much easier to comment back if someone has linked to their blog in the comments. So I've started doing the same. Not that I expect a comment-back (although it's always nice), but to lessen the hassle of going through blogger. I am super-excited for this book. More and more bloggers are posting reviews of the ARCs. It seems to be almost universally liked. Hey Alison, I came back to find an email to respond to your comment on my WOW, but no luck. Libyrinth and it's sequel are YA, but North is a pseudo for Anne Harris who writes for adults. My review and interview which I posted yesterday give a lo more info on this. Awesome pick! This book is on my wishlist! I'm also dying to read this one and absolutely love the cover too. Hey Alison, thanks for visiting my blog. I really want to read this one too it sounds so intriguing and the cover is so pretty. Thanks for the comment on my WOW. I cannot wait for Paranormalcy. It seems so good! I like when people leave their link (though, for some reason, I can't seem to figure it out! *headdesk*) but I don't like when the only comment they leave is something like "Hi! Just stopped by. Come visit me!" 'cause that seems like a cut & paste beg for followers (this doesn't include the Hops--that's a totally different thing). Paranormalcy does have some great buzz, and I love the cover. Def. on my wish list. 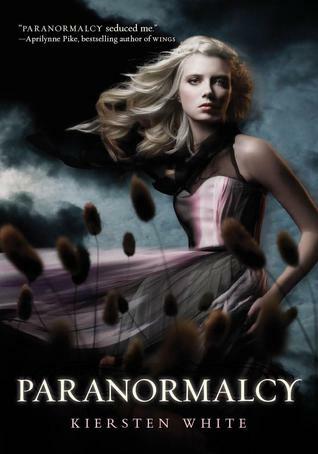 I've been wanting to read Paranormalcy ever since I first heard about it, it's gotten great reviews. I can't wait until it's out! On the links in comments---it only bothers me if I can tell that people are not really commenting on my blog to comment, but are just leaving a comment in order to link to themselves. So, if I feel like someone is using my blog as free advertising, it bugs me. If you're leaving a "real" comment then I like having the link because I like to comment back and it does make it so much easier. Thanks for getting this issue out there!!! I'm waiting for this one too! I'm anxious for this one as well. I just love the cover and I'm hearing great things about it. I didn't realize leaving your blog addy was a pet peeve. I love links left so I can visit the blog. I can see where it would be not as nice if it was a comment just linking to a blog. I usually say something relevant to the blog post and if it's a meme link back to my blog. I'm looking forward to Paranormalcy too! I didn't realize leaving a link to your blog was a pet peeve either. I don't mind. Although, with my blog I can't click on the link, so I just copy and past the blog URL. I always try to comment back. I feel if someone was nice enough to stop by my blog, I should return the favor. I hope that you get your book soon, and that it is everything you hope it to be. Here's my WOW Happy reading! I've seen this one a lot. My WOW is at The Crowded Leaf. As to your question, no, it doesn't bother me. In fact, if your blog link hadn't been in your comment on my WoW post, I probably wouldn't be here now. And my answer to your comment: no, I do not get mad when people link to their blog. Isn't that the whole point of posting a meme? For me, my blog is on Wordpress so blogger names don't always register. I don't know if someone wants me to check out their posting unless they tell me. So I don't visit unless someone leaves a link. Great pick! I'm waiting for Paranormalcy too. In answer to your question: I actually prefer for people to link to their blog when they make comments on my posts. It's so much easier to return the favor. I generally won't respond if there is no link for me to follow. I can't wait for Paranormalcy, either! I don't post a link to my blog when I comment, although I appreciate it when bloggers do so in their comments to me. I already put this book on top among of my TBR list.I'm so excited for it too!